This modular office furniture collection consists of laminate desks, metal storage cabinets, and tables that can be efficiently reconfigured for private offices, individual workstations, benching solutions, and training room applications. The metal drawers include fully extendable ball bearing drawer suspension. They offer 150 lbs. of maximum weight capacity while locking with ease. The Legend wood veneer office furniture shows positive results from the moment guests walk in your office area, they will be impressed by Legend's clean lines, sophisticated style, and attention to detail. The Legend lobby furniture has clean lines and ribbed edge detail in both the reception desk and conference tables. Efficient office storage cabinets abound to keep all critical documents at your fingertips. Make your first impression count. Choose the Legend office desks, conference room tables, and matching reception area furniture. Dreams become a reality when Regency Seating and Q design collaborated on one of the largest breakthroughs that the present day office furniture industry has ever seen. We are proud to introduce OneDesk, a representation of all that is desired in any office interior. OneDesk boasts sleek, stylish components that promote diversity and simplicity at the same time. All the quintessential elements of traditional wood furniture - classic lines, wood trim, and edge details - combine in the Prestige veneer desks, workstations, and conference tables. The Prestige wood veneer office furniture shows its classic design from the moment guests walk in your office. They will be impressed by Prestige's sophisticated style, and attention to luxurious detail. The Prestige furniture has classic lines and a elegant look in both the desk and cabinets. This Regency Elements office furniture collection consists of laminate desks, metal storage cabinets, and tables that can be efficiently reconfigured for private offices, individual workstations, benching solutions, and training room applications. 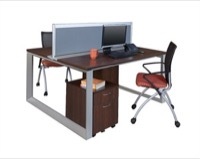 This Regency Fusion office furniture collection consists of laminate desks, metal storage cabinets, and tables that can be efficiently reconfigured for private offices, individual workstations, benching solutions, and training room applications. Regency Prestige - Conference Table - 10' x 48"
Regency Prestige - Conference Table - 12' x 52"
Regency Prestige - Conference Table - 16' x 52"
Regency Prestige - Conference Table - 20' x 52"
Regency Prestige - Conference Table - 24' x 52"
Regency Prestige - Conference Table - 8' x 48"